Update 11/7/15: Congratulations to Karen P.! She is the big winner of the Nest Bedding giveaway and will be receiving a brand new Honest Bed mattress. Thanks to everyone who entered. Check back soon for the next great Sleepopolis giveaway! Wish you could replace your old mattress? Here’s your chance to win a new one from Nest Bedding! Use the widget below to enter to win a brand new Honest Bed mattress! If you think you may want to buy an Honest Bed mattress don’t hesitate! If you buy an Honest Bed mattress between 10/21-11/05 and also win this giveaway you’ll be credited back for the full amount you paid. It’s win win! Win a brand new Honest Bed mattress from Nest Bedding! We’re giving away one (1) brand new Nest Bedding Honest Bed mattress. The Honest Bed is Nest Bedding’s first two sided, dual feel mattress (flippable with a medium and firm side). 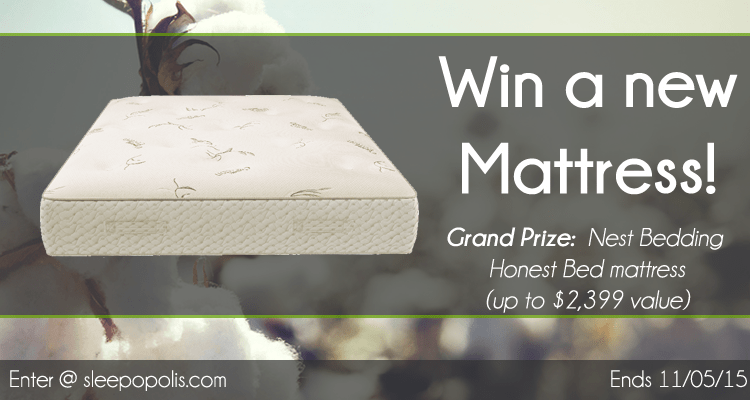 One grand prize winner will select their preferred size and material (latex or memory foam) of the Honest Bed mattress. Grand Prize: One (1) Nest Bedding Honest Bed mattress (valued up to $2,399). One (1) grand prize winner will be chosen. You’ll be able to select any size Nest Bedding Honest Bed mattress (Twin, Twin XL, Full, Queen, King, or California King) with your preferred material (latex or memory foam). Entries: You may enter up to 11 times, one for each entry method defined above. Only entries verified through the Gleam voting widget above will be counted. Winner: One (1) grand prize winner will be randomly selected based on the pool of entries at the conclusion of the giveaway. Winners will be contacted by no later than 11/8/2015. Winners will have 48 hours to respond by email. Non-response will result in disqualification and a new winner will be selected. Winners must provide a US mailing address, email address, and phone number to be able to claim their prize. Check out our Nest Bedding review series below for more information. The contests and giveaways of Sleepopolis wouldn’t be possible without our sponsors. A huge thank you to Nest Bedding for donating the prize for this giveaway! Has a winner been picked yet? My husband, myself and our twins could really use this. I am unable to work right now and money is a huge worry. So at least having somewhere to sleep would be great, thanks for having a contest like this. Yes. Karen P. was the big winner. But not to worry…another mattress giveaway is right around the corner! Question regarding notification. The rules have this statement: “Winners will be contacted by no later than 10/21/2015. Winners will have 48 hours to respond by email.” Obviously that can’t be correct as that’s the day the contest began. Would you please clarify when the winner will be notified? Thank you! Woops! Typo on my end. Winners will be contacted by no later than 11/8! Thanks. Time to throw out the old one. way past time! I need a new mattress. My back hurts. Our backs creak and groan for a new mattress! Ahhhh that feels better! It would be a dream come true to win. I never won anything in my 49 years. I would really like to win & replace my mattress. I have a very bad back problems and feet problems.I had cancer went through chemo it really did a number on my back and feet. Plus I am a diabetic. And I really cant afford right now. I thank you so much, I really appreciate uses For giving us a chance to try to win a free mattress.It is very generous of uses. again thank you so much. I would love to win this mattress!! I have not had a decent night’s sleep in years!!!!! My current mattress is spring and coil madness that provides zero comfort and minus zero support. My lower back hurts chronically to the point that I have to turn to ibuprofen frequently for relief. My mom is tired of me being in so much pain that she is saving to buy me a new mattress soon. Winning this would be a dream come true, especially since my b-day is tomorrow!!! Thanks for the giveaway!!!! It would be a dream come true to win a California King Sleepopolis mattress. My husband is 6’2″ and has to sleep on an angle to keep his feet from hanging off the bed. Add in two full grown Saint Bernards that do their best to sneak up on the bed during the night and you can see how much room that leaves me to sleep. (NONE) It would be so great to get a good nights sleep. It seems like it’s been forever since that happened. I’m keeping my fingers crossed because your Sleepopolis mattress sounds so comfortable. Thank you! Thanks for your kind words, Noreen! However, I do want to clarify that Sleepopolis simply reviews mattresses, other sleep products, and offers giveaways like this one. The mattress is actually designed and created by Nest Bedding. I would love a queen mattress because I have a new bed but an old mattress. Need a new one,hubby complains about ours with neck pain…a lot! Wow, this sounds like a great product! After sleeping on a mattress over 20 years old, which sinks in the middle, my back would love this! Both my hubby and I have back problems and I know our mattress is not helping the situation. I would love a new mattress and what great timing for the contest, for our 50th anniversary! It just launched 2 weeks ago. Very comfortable! I have never heard of this brand but we need a new mattress and it looks like a great one. After breaking a couple of bones in my spine and suffering from degenerative disc disease and also hurting my hip in a fall at work, I could really use a new mattress and not that old one I have now. This would be awesome! Thank you very much for the chance to win something I can’t afford right now. It is very generous of you! our mattress is 10 yrs. old we need a new one!! We are currently sleeping on one old mattress with holes in it piled on top of one we bought off of craigslist that we could feel every single move the other person made. I spend 21-22 hours a day in the bed so I really need to think about investing in a better one. Thanks for the review, it is certainly something to think about. I rely heavily on reviews before making a purchase. You’re welcome! Best of luck to you in the giveaway. Hubby needs a new mattress, hope we win. I suffer from chronic back/spine pain due to degenerative disc disease and I would be so grateful to win your mattress and rate it! Really need a new mattress but can’t afford one right now. Hope we win. Sleepopolis is very helpful. Thanks. Thank you for your kind words, Lilly! I’m glad Sleepopolis has been a help to you. I really need a new mattress and this would really make ke happy. I have no bed at all! I desperately need to win one. Opps, forgot my email addy! I know your going to sleep well! That bed looks amazing! We really need a mattress! Can’t wait for your review in full! That bed looks so great! I know your going to sleep well! I am really hoping to win. Our bed is horrid! We need a queen mattress! In the market for a new mattress. Hope I win! Your message couldn’t be sent because it includes content that other people on Facebook have reported as abusive. <<<< message I received when trying to share my special link on my facebook timeline. Hrm…interesting, sorry about that Ann. Maybe try writing your own little description instead of using the one I provided? As long as you have the same link you’ll be good to go! I got the same weird message! I do hope that I could win a twin(single size) mattress! Just purchased a Leesa based on Sleepopolis’s reviews for heavier sleepers. So far so good, and yes I would love to win an Honest Bed mattress as well. That’s great! I’m glad to hear the Leesa is working out for you. Best of luck to you in the giveaway! Great concept and even better name! It is pretty crazy how they are able to compress these mattresses. This one in particular was wild to see the springs come to life like that. Just ordered one, will see how good it is. Will post after a few days. Definitely let me know how you like it, Tatyana!